I love Bethnal Green. I think that it’s one of the best places in the world and that any Londoner who lives elsewhere is a moron. For nearly two years I’ve been on a one-woman campaign to try and persuade anyone who doesn’t live there to move immediately. So far my conversion rate is nil. But I think persistence is the key—and, like any good missionary, I won’t stop until I’ve rescued everybody I know and love who has lost their way and ended up south of the river. I shall gather my ‘flock’ and herd them over London Bridge to the Eden that is Bethnal Green where we can live together in harmony and bliss. Like anyone who is madly in love, I can only see things through rose-tinted glasses. If anyone from SW3 dare suggest that Bethnal Green is quite far out, I reply that it is, of course, them who is out in the sticks. Not me. If someone dares bring up crime rates in Tower Hamlets, then I’ll allude to the handbag-nickings that go on in the posh ol’ West End. I can only see the charm of the street market—not the mess, and all the pretty local dogs—not the snarling staffies. It’s like selective hearing—but a type that affects sight as well as sound. 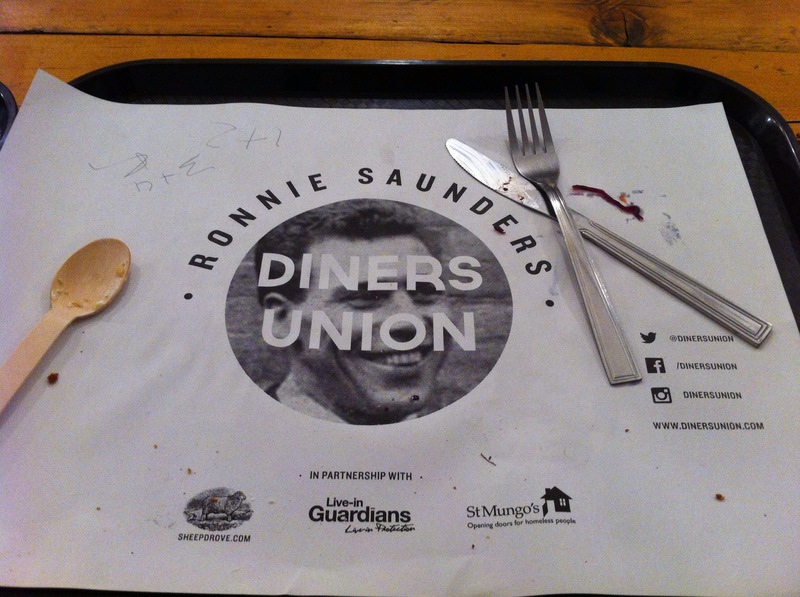 I expect it’s no huge surprise that restaurants are a prominent feature in my Bethnal Green marketing spiel. But, dear readers, I must confess that that my monologues on the burgeoning food scene in East London are the teeniest, tiniest bit biased as well. As part of my propaganda mission, I have only written about the recent bout of ‘regeneration restaurants’: Corner Room, Viajante, Brawn…etc. But in doing so, I have failed to mention that the vast majority of the places to eat on Bethnal Green Road itself are, well…scrot. The stark reality is that it’s a road littered with chicken bones from greasy fast food joints. Gregg’s and KFC are quite a big deal, and you can get more prawn crackers than you can eat for £1 at Noodle King. But you won’t feel good afterwards. E.Pellicci and Cafe 338 are super—but more for soaking up lastnight’s booze than a gastronomic experience, and G.Kelly’s pie and mash is only really good for an authentic, post-war rationing experience. So I thought that—for the sake of bringing you an accurate depiction of Bethnal Green Road—I’d review a…more representative restaurant in the area rather than one of the newbies that are bucking the trend. 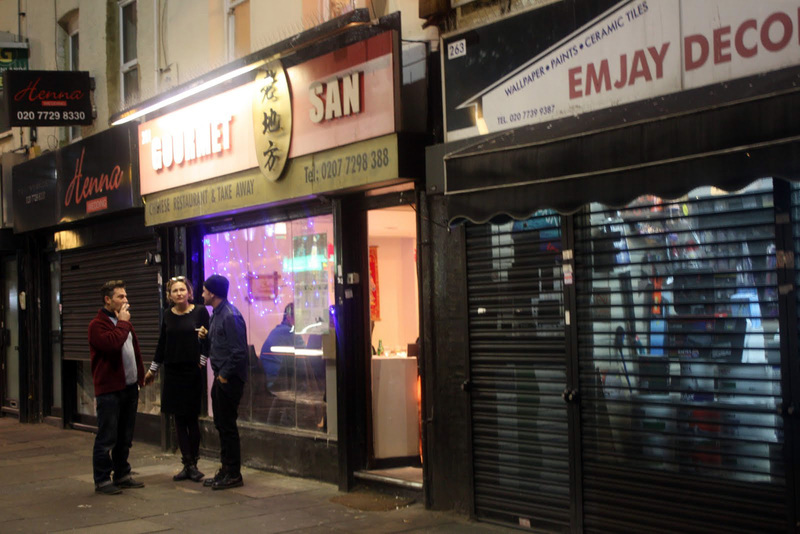 Now, I have lived in Bethnal Green for more than two years, and (if I average one walk up and down Bethnal Green Road per day), I must have passed Gourmet San over a thousand times now. But I’d never noticed the bleak little Chinese restaurant sandwiched between a DIY shop and a kebab house. 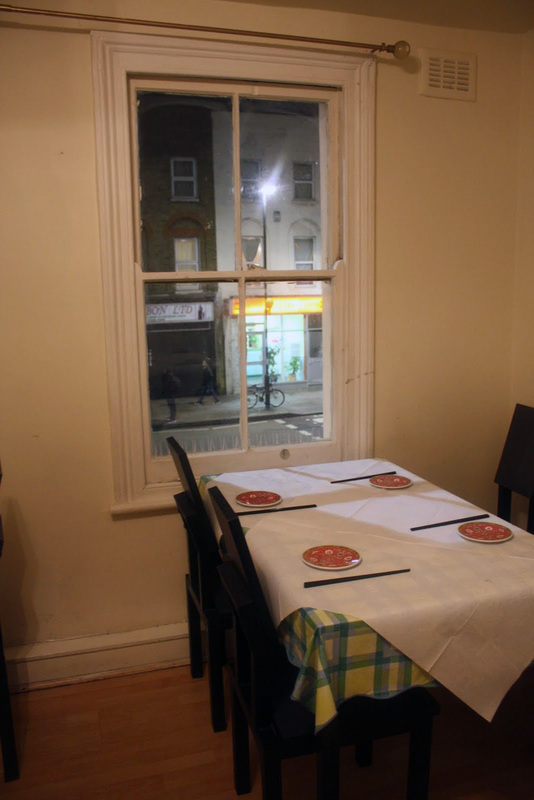 That was until a Chinese friend (who considered himself somewhat of an authority on Chinese food) told me that it was the best Chinese restaurant in all of London—forget Soho’s China Town…tourist rubbish…this is the real deal. Since then I began to notice how packed it was whenever I passed it. So when a couple of friends recently mentioned its cult-status, I thought it was time to pay Gourmet San a visit. When we arrived, the downstairs room was packed out. The Maneki Neko (beckoning cat) bobbed its raised paw from the counter and conversation rose over the sound from the wall-mounted plasma. We were taken upstairs to a silent, undecorated room. Though when I say ‘room’, I might mean a bedroom—just with no bed in it. Gourmet San was definitely more ‘house’ than ‘restaurant’. 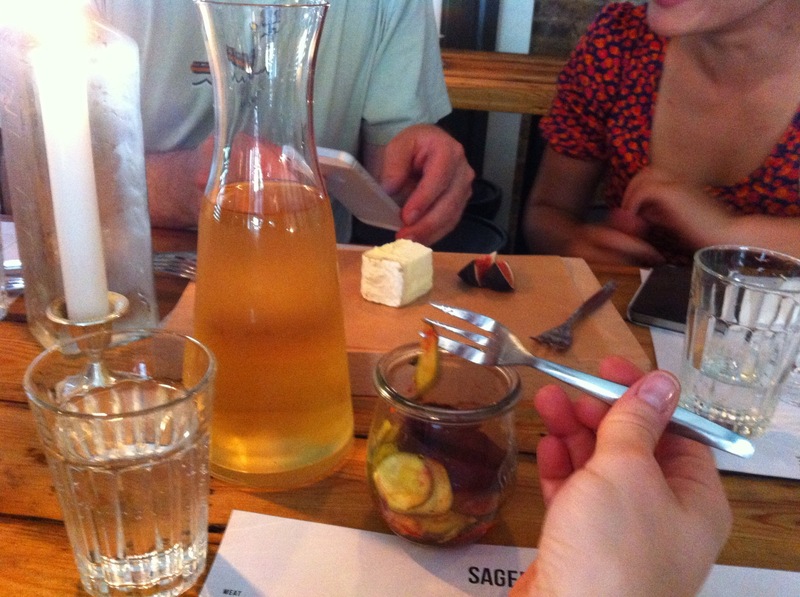 Reminiscent of Selly Oak university dinners with ikea tables and never quite enough space. Perhaps when all the diners left, someone pressed a button which whisked the tables and chairs into cupboards and flipped a Murphy bed out of the wall. Just as I was thinking how extraordinarily bland the interior was, I was handed a menu, which was enough to avert all attention from the white walls and to the pages and pages of food which easily constituted the weirdest menu I’ve ever come across. It makes Heston look like a pussycat, and St John’s seem as if it’s using the safe cuts of meat. If you’re into barbecued meat then you can have BBQ rabbit back leg or the BBQ rabbit front leg or the BBQ rabbit kidney—or perhaps a BBQ quail if rabbit isn’t your thing. There’s sautéed ox tripe slices with scallion—and if you’re not a fan of sautéing, there’s braised ox tripe slices with mashed garlic instead. Sea animals meet land mammals with bizarre combinations such as pork lungs and fish in chilli sauce or spicy pig intestines and fish head. And creations for those with a more adventurous palette include jellyfish with black vinegar or stir fried prawn with tea leaf. Now, the formative years of my education in food took place during the era of Ramsey’s Kitchen Nightmares. For those who missed the endless installments of this hour-long epic, the general formula of the program would involve Gordon exposing the rotting pantries and revolting food in restaurants which were serving 45 bad dishes. He’d pare down the menu to five dishes using fresh ingredients, paint the walls a different colour, and everyone would live happily ever after. So imagine my horror at the 126-dish menu at Gourmet San which included at least 60% of the animals that made it onto Noah’s Arc—the logistics alone are mind-boggling. Even if all the ingredients are frozen, how on earth do they all fit in one or even two or three chest freezers? And what unnecessary anxiety it turned out to be. 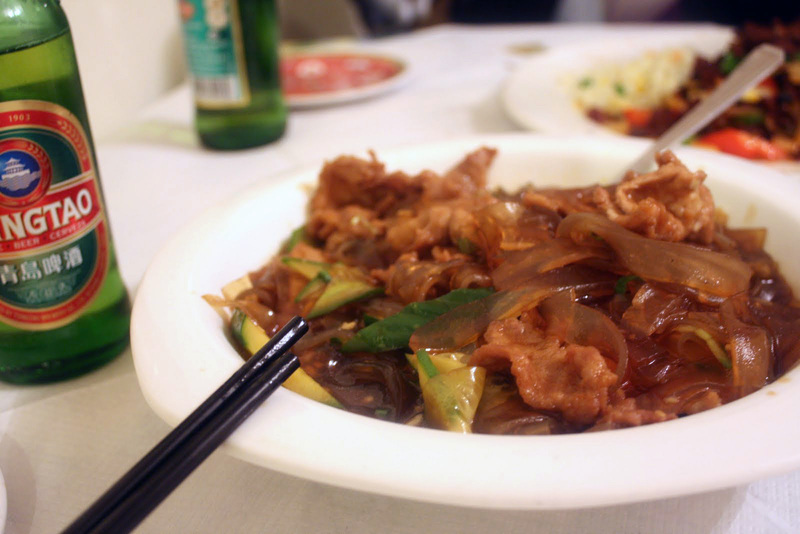 By the time I’d sipped half a Tsingtao, a steaming hot bowl of delicious food arrived. Unlike other greasy, battered or too-sweet Chinese food, this was balanced and tasty and wholesome. The translucent noodles looked like laminaria seaweed and tasted light and beautiful, and the chicken was just scrumptious for a someone who loves garlic as much as I do. I’ve got no idea how they did it. Especially as two beers and two big main courses came to a not-so-big £24. As we left, we walked past six tables downstairs with happy diners eating the widest range of dishes: squid, then aubergine, then sea bass, then chicken stir fry and rabbit. And they all looked delicious. So apologies for my Bethnal Green Road bigotry. I set out to bring you a real east end restaurant review, and I have. It was great. Another reason to come and live in E2. PPS. And if you want to find out why The Observer ran such a lame picture with the review, click here.